For the charter township, see Royal Oak Charter Township, Michigan. 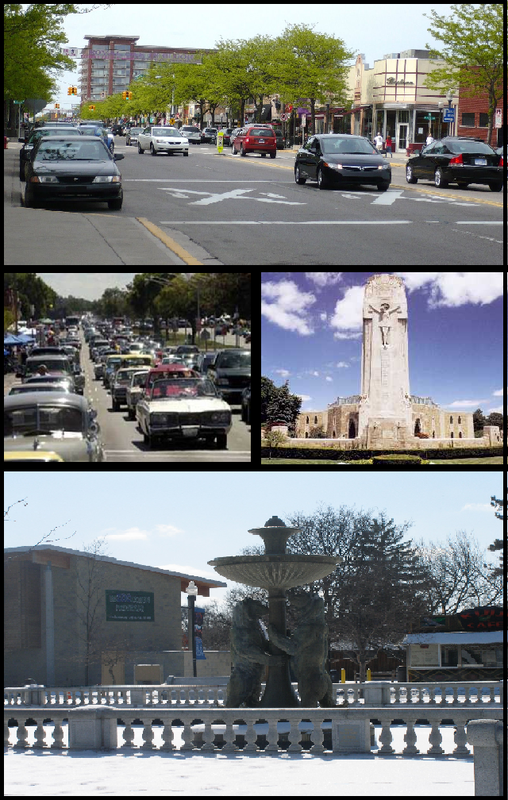 Pictured left to right: Downtown Royal Oak, the National Shrine of the Little Flower church, the Rackham Memorial Fountain at the Detroit Zoo, and the Woodward Dream Cruise. Royal Oak was incorporated as a village in 1891, and as a city in 1921. The city's name originates in 1819, from one of Territorial Governor Lewis Cass' expeditions surveying land. A tree located near the present-day intersection of Crooks, Rochester, and Main reminded Cass of the Royal Oak tree within which King Charles II of England hid to escape the Roundheads following the Battle of Worcester. Throughout the late 1990s and early 2000s, Royal Oak's downtown grew into an entertainment and nightlife destination. A number of large condominiums and lofts have been constructed in the area. Downtown Royal Oak features a wide assortment of nightlife venues, including the Royal Oak Music Theatre and the Landmark Main Art Theatre. Royal Oak is home to the Detroit Zoo, one of the region's leading tourist attractions. Mark Ridley's Comedy Castle, a comedy club, was an early venue for performers such as Tim Allen and Dave Coulier. The many restaurants range in fare from take-out sandwiches to high-end establishments specializing in cuisines like Italian, Belgian, Nepali, and others. Pubs include biker bars, dance clubs, upscale breweries, sports bars, and rooftop bars. During the summer, downtown Royal Oak becomes host to hordes of motorcycle enthusiasts from around Metro Detroit. On Wednesday nights Main Street is often lined with Harley-Davidsons, whereas on Thursday night the streets fill up with sport bikes. The popular 1990s sitcom Home Improvement was set in Royal Oak. In 2008, three movies were filmed in Royal Oak. Scenes from Prayers for Bobby, Youth in Revolt and Gran Torino were filmed in the downtown area. In 2009, the remake of Red Dawn had several scenes filmed in Royal Oak neighborhoods. In December 2009 it was announced that the Arts, Beats and Eats festival would be moved from Pontiac to Royal Oak. In addition to The Detroit News and Detroit Free Press, regional newspapers serving all of southeast Michigan, the city is served by the Daily Tribune, The Oakland Press, the Royal Oak Review, and The Mirror. According to the United States Census Bureau, the city has a total area of 11.79 square miles (30.54 km2), all of it land. Royal Oak once had a river, the Red Run. Twisty Vinsetta Boulevard was built skirting a source branch of the Red Run for its median, but in the 1930s, Vinsetta's entire median along with the river and all but the top of the bridges for the crossing streets were filled in as part of a WPA project. During 1967–8, the rest of the river in Oakland County was buried in a 6-foot drain pipe. Royal Oak's traditional street-side shopping district runs along Main Street and Washington Avenue downtown. It experienced growth and development in the 2000s, with a transformation to a trendy upscale, urban-chic restaurant, shopping, and entertainment district. A number of mixed-use high-rise developments have arisen — mostly condo "lofts" with retail and office space on the lower levels. Points of interest include the Detroit Zoo, a major regional tourist attraction, the William Beaumont Hospital, the Royal Oak Music Theatre, the Main Art Theatre, the Baldwin Theatre, Mark Ridley's Comedy Castle, Emagine Theater, and shops, cafes, and restaurants. The main offices of Hour Detroit media, which publishes Metro Detroit's lifestyle magazine, are located in the city. The National Arbor Day Foundation has awarded Royal Oak the distinction of "Tree City USA" every year since 1976 as a result of the city's commitment to tree planting and preservation. In 1998, the foundation of Saturday Night Live comedian and Detroit-area native Gilda Radner created a free cancer support community for people with cancer, their families, and friends. Gilda's Club Metro Detroit operates a three-story non-residential house in Royal Oak and has served more than 3,000 members for social and emotional support and fun activities. The city is served by Royal Oak Neighborhood Schools. There is also a private high school, Shrine Catholic. A branch of Oakland Community College is located in the city. In recent years Royal Oak has begun to consolidate its public schools in response to enrollment levels that are lower than those of the baby boom era. In 2006, the city's two public high schools, George A. Dondero High School and Clarence M. Kimball High School, were combined into a new Royal Oak High School. Beginning in 2007, the city's two middle schools were combined into one school, Royal Oak Middle School. The number of elementary schools was reduced to six. Some parents protested the planned closure and demolition of Longfellow and Whittier elementary schools and were seeking to have them considered for historic district recognition by way of signed petition. Despite their efforts, both schools and a number of other former elementary schools were demolished in the fall of 2007. Royal Oak has a Council-Manager form of government. It is governed by a city commission consisting of a mayor and six commission members. The city commission appoints a city manager, who manages the day-to-day operations of the city. Royal Oak has a below average crime rate, reflecting that of nearby communities, such as Berkley and Madison Heights. Larceny-Theft was the most common crime, making up 66.7% of all crimes in the city. Five known murders have been committed since 2000, one in 2004, one in 2005, one in 2010, and two in 2011. Royal Oak's police department has 64 sworn officers  and 21 un-sworn officers in the department. The department employs community policing techniques. Royal Oak has a fire department that operates out of three stations strategically located around the city to minimize response time to incidents. The ROFD operates two ladder trucks, four ALS ambulances, and six engines, along with a technical response trailer, a haz-mat trailer, and utility vehicles. As of the census of 2010, there were 57,236 people, 28,063 households, and 13,394 families residing in the city. The population density was 4,854.6 inhabitants per square mile (1,874.4 /km2). There were 30,207 housing units at an average density of 2,562.1 per square mile (989.2 /km2). The racial makeup of the city was 90.7% White, 4.3% African American, 0.3% Native American, 2.4% Asian, 0.4% from other races, and 1.9% from two or more races. Hispanic or Latino of any race were 2.3% of the population. There were 28,063 households of which 20.0% had children under the age of 18 living with them, 36.7% were married couples living together, 8.1% had a female householder with no husband present, 3.0% had a male householder with no wife present, and 52.3% were non-families. 41.4% of all households were made up of individuals and 10.7% had someone living alone who was 65 years of age or older. The average household size was 2.03 and the average family size was 2.82. The median age in the city was 37.8 years. 16.7% of residents were under the age of 18; 7.6% were between the ages of 18 and 24; 35.9% were from 25 to 44; 26.8% were from 45 to 64; and 13.1% were 65 years of age or older. The gender makeup of the city was 49.0% male and 51.0% female. Amtrak provides service to Royal Oak, operating its Template:Amtrak lines three times daily in both directions between Pontiac and Chicago via Detroit. Commuter rail service was once provided by Grand Trunk Western Railroad (GTW) and later Southeastern Michigan Transportation Authority (SEMTA) from Pontiac to downtown Detroit, with a stop in Royal Oak. This service ended on October 17, 1983, after subsidies were discontinued. Efforts continue to this day to restore such commuter service. There is an interchange connecting Interstate 75 and Interstate 696 in the southeast corner of the city. Woodward Avenue (M-1) is about a mile (1.6 ) west of the interchange in the southeast corner of the city. Woodward proceeds northwest defining the western border of the city, and intersects with the north-south Coolidge Highway just south of 13 Mile Road. The southern terminus of Rochester Road, about a half-mile north of the downtown district, connects Royal Oak with Rochester, and continues on beyond Rochester. This road had been the route of an early 1900s electric trolley line that connected downtown Royal Oak with downtown Rochester. 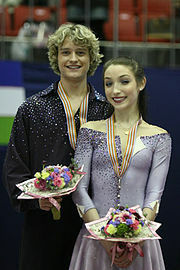 Meryl Davis, figure skater, winner of the silver medal in ice dancing at the 2010 Winter Olympic Games in Vancouver. Joe Yerke (singer/songwriter) for The Insyderz, 1999 Dove Award winner. ^ "Race, Hispanic or Latino, Age, and Housing Occupancy: 2010 Census Redistricting Data (Public Law 94-171) Summary File (QT-PL), Royal Oak city, Michigan". U.S. Census Bureau, American FactFinder 2. http://factfinder2.census.gov. Retrieved August 19, 2011. ^ "Father Charles E. Coughlin, The Radio Priest". Detroit News: Michigan History. 1995-07-23. http://info.detnews.com/redesign/history/story/historytemplate.cfm?id=43. ^ Penney, David G. Ph.D. (2001-11-28). "A Run Ran Through It: Red Run, The Ghost River of Royal Oak". CO Headquarters. http://www.coheadquarters.com/PennLibr/HistoricRO/Muller1.htm. Retrieved 2008-11-25. ^ Royal Oak Fire Dept. Wikivoyage has a travel guide for Royal Oak. This page uses content from the English language Wikipedia. The original content was at Royal Oak, Michigan. The list of authors can be seen in the page history. As with this Familypedia wiki, the content of Wikipedia is available under the Creative Commons License.